The Independent School Entrance Exam (ISEE Test) is an achievement and reasoning test developed by the Educational Records Bureau (ERB) that is used to evaluate children around the country for private school entry. While ISEE scores are an important component of the student’s application to these schools, other factors, such as school records and interviews, also determine whether the child is offered a seat into the school. The ISEE is offered at three different levels, with each level consisting of four sections plus on optional section. Except for the Primary level, all ISEE levels include all five sections. The Primary level only has the reading, math, and optional writing sections. Students entering 2nd grade will also be given an auditory comprehension (listening) section. The materials at TestingMom.com can be used for 4th, 5th and 6th graders applying to the next grade level. Our Parent Success Team is also available around the clock to help you with any questions you may have regarding the ISEE and private school admission. Below is a description of each of the five sections on the ISEE test. Verbal Reasoning: This portion of the ISEE aims to assess a student’s vocabulary as well as their ability to reason and problem solve. The section consists of synonyms and sentence completion. The synonym component tests the student’s ability to choose a word that is similar to the target word. The sentence completion component tests the student’s ability to properly fill in a sentence by picking the correct word from the answer choices provided. Math Achievement: The questions on this section call for the identification of, and solutions to, problems requiring one or more steps in calculation. These items target skills pertaining to decimals, percents and fractions; and measurement (to name a few). Reading Comprehension: Students completing a lower level examination will read five passages, each accompanied by five questions. Students completing the middle and upper levels will read six passages that are accompanied by six questions. These questions cover topics such as main ideas, supporting ideas, vocabulary, organizational structure, tone, and figurative language. Essay: On all three levels, the student is required to plan and write a well-organized essay. This writing sample will be submitted to the school to which they are applying and allows the school to develop a sense of the student’s writing ability. While the essay does not receive an overall score, it is photocopied and sent to each school. How is the ISEE Administered? When it comes to actually taking the ISEE, there are a few different options. A student has the option of taking part in “large group testing” at a school, or “small group testing”, offered at various testing offices. Currently, the test is being offered in both an online and paper-based format (The Primary Level is only available online). Both formats consist of the same number of questions as well as the same timing. Scaled score: ISEE scaled scores for each section will range from 760 to 940. The scaled score is based upon the raw score, which is the number of questions that the student answers correctly. ERB will administer different versions of the ISEE each year. The scaled is able to take these changes into account and is able to allow ERB to report a score on a common scale that has the same meaning for all students. This is possible regardless of the test version that is taken. Percentile Rank: The percentile rank is intended to compare the student’s standing when compared to other students in the norm group. Percentile rank scores will range from 1 to 99. For example, if a student scores a 55 on mathematics then that means that the student scored as well or as better than 55 percent of all students in the norm group and less well than 44 percent (out of a total of 99 percentile points). A stanine analysis is intended to compare a student’s performance on the ability tests and the related achievement tests. These comparisons are made between verbal reasoning (V) and reading comprehension (R), as well as between quantitative reasoning (Q) and mathematics achievement (M). Each of these letters found in the stanine analysis box, located in the test profile, is the midpoint of a band that goes to either side of the stanine score. The percentile score is an estimate of a student’s level of knowledge. 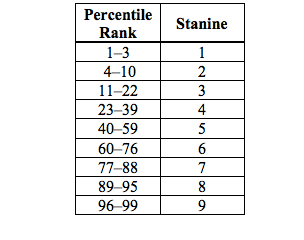 If the stanine is 5, for example, the percentile rank range is 40-59. In the analysis portion, each section score indicates the number of questions answered correctly, the number of questions answered incorrectly and the number of questions omitted or not reached. For each section, the score is broken down by type of question, providing more specific information about a student’s relative strengths and weaknesses. Video: What is the ISEE Test? My wife and I as grandparents are interested in assisting our granddaughter’s educational growth, we are likely going to be assuming responsibility for Aimee due to her mom’s health issues. Do you offer ISEE primary sample questions at all? I hoped to get some information in this sight so my kid can be familiarize with the question types. Please advise.